Mountain Views: Residents Share a Peek into Life at Grace Ridge - Grace Ridge Retirement Community - Morganton, N.C. The power in our senior living apartment building just suddenly went off. There is really nothing to worry about; I’m always prepared with extra candles and flashlights. We’ll be okay … it’s still daylight, at least for another 45 minutes. It has been announced that we will be on generator power until the city can figure out the problem. It is now within 30 minutes of our evening meal and they have let us know that the fried chicken breasts will be replaced with sandwiches and chips because they do not know when the power will come back on. There are no lights in the building except for the emergency lights. This is still fine … we will be okay! But, even though “all is well,” I just realized that I cannot get out of my lift chair – it’s operated with electricity! 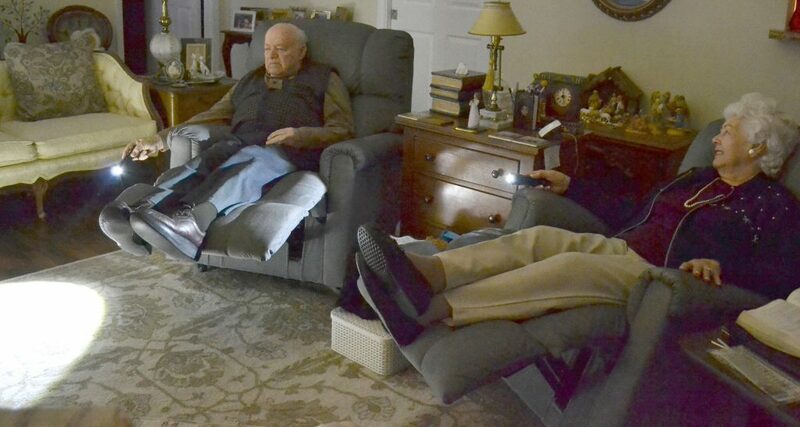 And, Bill is at full recline and with his Parkinson’s disease, it will be difficult for him to get out of his chair. And, he just said that it was time for him to go to the bathroom. And, oh, my goodness. He says it’s urgent. He has now made a proclamation to get out of his chair and he is proceeding to lift one leg over the side of his chair in an effort to get out. He says all he has to do is get the other foot on the floor. Then he suggests that I might like to get his walker and be ready to take him to the bathroom. After several minutes, we both realized the humor of the moment and got the giggles. “Don’t make me laugh. I’ve got to go to the bathroom and you’re making it worse.” I might as well go ahead and see if I can exit my chair without breaking my neck. Bill’s idea of getting one foot to touch the floor and then swinging the other leg down to the floor is working pretty well for me. But now, here I sit perched with both legs dangling from the side of my chair, my feet not quite touching the floor. For some reason, I can’t get the momentum to pull myself another four inches to the edge of the chair. I counted to three … “one, two, three” … and there, I gave it all of my energy and managed to get both feet on the floor. Now, to get Bill out of his chair. I looked over at him and, as usual, he had that determined look on his face, but he was not making much progress. After positioning Bill’s walker at the side of his chair, he pulled himself up and took off in high gear towards the bathroom … with me in tow … following with the flashlight. Mission finally accomplished, we began trying to get ourselves back into our lift chairs for the remaining time of the blackout. Getting back into our chairs was a little easier. We sat down on the side of the extended foot rest, swiveled ourselves around, placed our feet on the bottom of the foot rest and then, with all our might, pushed backwards to get ourselves into a sitting position. After squirming around to find the most comfortable position, we are reclining again and waiting for the power to come back on. It’s been over 40 minutes now … we’ve talked about everything since 1952! We got into a big discussion about how we met in a 12th grade English class at East Mecklenburg High School. His version of the event was quite different from mine, but that in itself is another story. Meeting in this English class was the beginning of a lifelong friendship. We have been married for 64 years, and we have had a wonderful life together. Still just sitting here in the dark … talking quietly about things in years gone by. The peacefulness and stillness of the night surrounds us as we thank God for our children and grandchildren, our wonderful friends down through the years and now our new acquaintances here at Grace Ridge. We are so thankful for His love and guidance.